Posting a brief update to share a few exciting things that have happened in the past few months. First, my article "Teaching metaliteracy: a new paradigm in action," authored with my co-everything and dear friend Teresa Grettano, and published in 2014 in Reference Services Review 42.2, has been recognized for two different awards and honors. ALA's Library Instruction Round Table (LIRT) has named it as one of its Top Twenty 2014 Library Instruction and Information Literacy Articles. Their June 2015 newsletter [pdf] features our article on page 13, including an article summary written by their selection committee which does a fantastic job articulating our goals and findings, as well as their significance. Teresa wrote up a piece describing this recognition for her department blog. The article has also been recognized by the journal's editorial team as an Outstanding Paper in the 2015 Emerald Literati Network Awards for Excellence. More information about how the Outstanding Papers are chosen can be found here and here. As a result of this recognition, Emerald (the publisher) has made the final publication version of the article available free for one year on their website, accessible at this link. 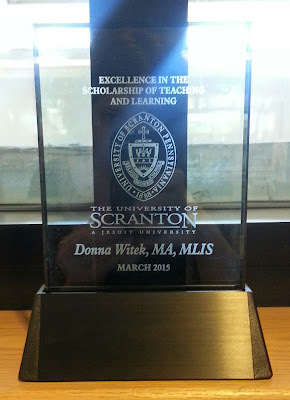 Teresa wrote up a piece for her department blog about this recognition as well. This was the article Teresa and I wrote after the first run of our co-designed and co-taught course, Rhetoric & Social Media. In it we describe the effects of social media use on students' information behaviors, attitudes, and practices, including that: 1) information now comes to users; 2) information recall and attribution are now social; 3) evaluation is now social; and, 4) information is now open. This article also develops further in the literature the relationship between information literacy and metaliteracy, by presenting our findings through the lens of Mackey and Jacobson's emergent metaliteracy framework. In addition to the above recognition for our article, Teresa and I were both awarded by our Provost Faculty Enhancement Awards for Excellence in the Scholarship of Teaching and Learning this past Spring 2015. The citation that accompanied both of our awards described our work in our Rhetoric & Social Media course, which has now ran four times since we first created it, as well as our "Teaching metaliteracy" article, as evidence of our excellent work in the Scholarship of Teaching and Learning (SoTL). More information about the Provost's Faculty Enhancement Awards can be found at this link (scroll down to item III. ), and the list of 2015 winners in all categories (not just SoTL) are viewable here. These SoTL awards were a complete surprise to both of us: we didn't even know we were nominated. And, we found out while in Portland, OR for ACRL 2015, where we were co-facilitating a workshop about writing and information literacy collaboration--so, in other words, doing the very work abroad we were being recognized for back home. All of our colleagues who attended the awards dinner heard our names announced and texted us the news, which was a surreal experience to say the least. And, believe it or not, this recognition comes with a $1500 award to be put toward any activity or equipment that will directly contribute to my continued professional success (!!!). I plan to use it to buy an iPad, which I will use to begin experimenting with doing my research-reading digitally (including highlights and annotations). All in all, it's been a very rewarding (~rimshot~) past few months that have made me feel fortunate and blessed that I get to do the work I do, with the people I get to do it with. *Edited 7/15/15 to add a note to say: Please excuse errors in the final publication version of "Teaching metaliteracy" introduced by Emerald's copyeditors in the final stage of the publication process. Teresa and I were not given the option to review proofs before the article went to print, and attempts to have the final publication version corrected have not been successful. For this reason, while the Emerald version is the better version to cite, it may be that our author-archived post-print version is easier to read.